If you don't already have a managers object create one first. A simple empty object will suffice. On the managers object add the "DialogueManager" component. The DialogueManager has a single reference to the DialogueUI component, which we will add later. To display the dialogue to the player we'll haev to add teh Dialogue UI. You can grab the default dialogue UI component from: Devdog / QuestSystemPro / Designs / RPGStyle / WindowPrefabs / Dialogue_PFB. Drag this prefab into your canvas and link it in the DialogueManager component created in step 1. To trigger a dialogue we can use a dialogue owner, this is the 'npc' that owns this dialouge. Simply create a new object (for example a cube) and place it in the world. 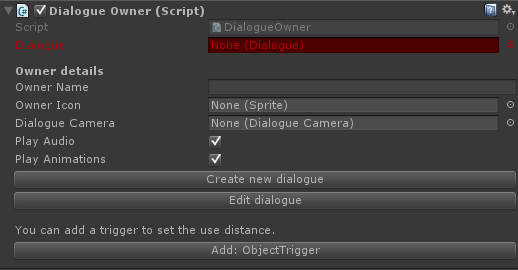 Note that the DialogueOwner either must have a collider OR an object trigger that triggers the dialogue owner when you come into range. On the DialogueOwner you'll see a red field "Dialogue". The dialogue field is required and can not be empty. At the bottom of the component there's a button "Create new dialogue". This will create a new dialogue and link it directly to this dialogue owner, and finally open the dialogue editor. How to use the dialogue editor is covered here.